Rice bran oil may lower LDL levels without lowering HDL, good choles-terol. It has a very high smoke point, 490°F, so can be used for deep fat frying. Photo by Emily Chang | THE NIBBLE. This is Page 5 of a six-page glossary of the different types of cooking oil. Click on the black links below to visit other pages. Also see our other delicious food glossaries. Palm oil, pressed from the pulp of the fruit of the African palm, has a red-orange color, a strong, unique flavor, and is very popular in the preparation of dishes in the Caribbean, Central and South America, and Western Africa. Only 50% of palm oil is saturated fat, compared with 80% off palm kernel oil; some research suggests that the fatty acids in palm oil don't raise cholesterol the way saturated fats typically do. It contains a fair amount of heart-healthy carotenoids. Palm oil is reddish, but there is a highly refined version that has very little color. Palm kernel oil differs from palm oil in that it is extracted from the kernel rather than the fruit of the palm. It has a light yellow color and it has a milder flavor than palm oil. Like coconut oil, it is extremely high in saturated fat, but because the saturated fat in the oil is plant based, some studies suggest that it does not raise LDL (bad) cholesterol in the body (see coconut oil). Palm kernel oil is often used in the manufacture of cosmetics and in some brands of margarine. Domestic peanut oil is almost clear and has a mild flavor due to the refining process. Chinese peanut oil has a more pronounced peanut taste and aroma. Refined peanut oil has a high smoke point and is popular for sautéing and frying. It does not absorb or transfer flavors from food during the cooking process. It is also high in monounsaturated and polyunsaturated fats, which makes it a healthy oil to use for cooking or as a base for dressings. It will keep for long periods if stored in its original container in a cool, dark place. Peanut oil is also known as groundnut oil and it should be remembered that its use in cooking might cause severe illness in people allergic to peanuts. Pine seed oil, which is obtained from pine nuts, is one of the most expensive oils on the market—$2.39 an ounce compared to $.55 for walnut oil. Thus, its appeal is very limited. It provides a nutty, earthy fragrance and taste to salads, as a condiment, or as a dress for almost any steamed or roasted vegetable. Add a tablespoon or two to pesto. Hard-to-find but worth it, this distinctive oil pairs beautifully with salads that contain citrus or avocado, arugula and other spicy greens (cress, red mustard greens and mizuna, e.g.). Try a vinaigrette of 5 to 6 tablespoons of oil with 1/4 fresh lemon juice and a tablespoon of shallots, salt and pepper to taste; with a citrus or avocado salad try an optional tablespoon of honey. Pistachio oil is a delicious anointing oil for fresh goat cheeses (especially delightful when the rounds have been rolled in chopped pistachio nuts), grilled fish and shellfish. It also goes well with many Middle Eastern dishes, especially couscous and lamb. Poppy seed oil has a smooth, subtle flavor that works as a dipping oil and a salad oil. Pumpkin seed oil, pressed from roasted pumpkin seeds, is thick, dark and opaque with a strong flavor. It can be combined with milder oils for salad dressings or used undiluted to add a distinctive flavor to fish or vegetables. See canola oil. Not to be confused with grapeseed oil. Rice bran oil (photo at right) is made from the bran of the rice bran, the brown portion that is removed from the grain of rice during processing. Most of the nutrients are in the bran, so it produces a very healthy oil, rich in amino acids, antioxidants, essential fatty acids, minerals and vitamins, including vitamin E, as well as gamma oryzanol, which stimulates the release of endorphins and promotes the growth of lean muscle tissue. Research has shown that rice bran oil’s properties may lower LDL cholesterol levels without lowering HDL, good cholesterol. Rice bran oil can be flavorless like canola oil, or nutty tasting, depending on the processing. It is an all purpose oil, favored as a cooking oil because of its very high smoke point, 490°F. 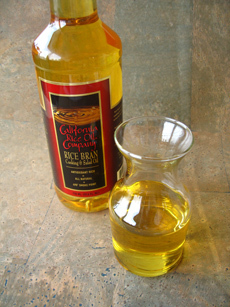 For more information, visit CaliforniaRiceOil.com.